Awareness, promotion and achieving high standards of animal welfare should always be a key priority within sustainable livestock practices. Gaining an understanding of an animal’s behavioural and physiological needs are cornerstones that enable us to develop systems of production that promote positive welfare. But how do we go about measuring welfare so that we can understand the strengths and weaknesses of a system and to continuously improve? There are a number of approaches that may be adopted to measure and assess animal welfare although it is accepted that no one measure used alone is sufficient to accurately determine welfare status (Mason & Mendl, 1993; Fraser, 2003). Welfare assessments can be broadly categorised into resource (input) and animal (output) based measures (Main et al, 2003). The most effective assessment procedures are likely to be those that include both input and output measures (Johnsen et al, 2001). 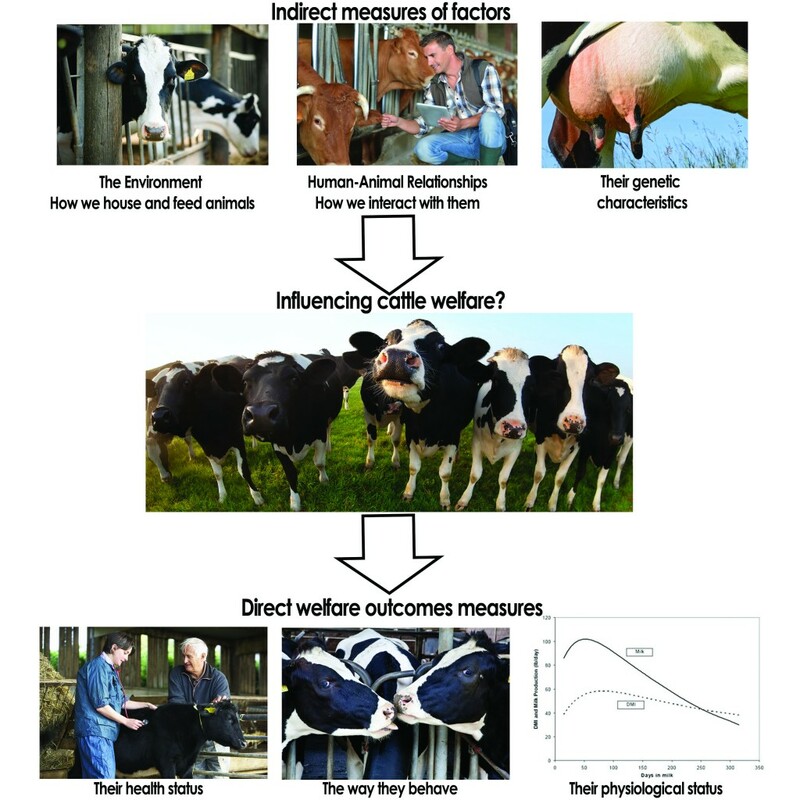 Practical measures of animal welfare assessment that can be used at the farm level as planning and inspection tools and quality assurance indicators need to be inexpensive, not too time consuming, simple and applicable to groups of animals whilst also being repeatable and objective giving valid results (Scott et al, 2001; Hörning, 2001). Although quantifiable measures of physiological status, such as body temperature, heart rate and levels of cortisol have been suggested as measures of welfare, the techniques are often time consuming, costly and variable depending on animal and environment and tend to be impractical for use as routine on-farm welfare assessment. Most welfare standards for farm animals, including those used by farm assurance schemes, are based on ‘inputs’, in that they describe the physical conditions and resources that are provided to animals that are likely to influence welfare, for example, feeding, housing, management and veterinary care. More recently, protocols e.g. Whay et al., 2003 have been developed that enable farmers and others to assess welfare using simple to use animal-based measures. Why should I think about welfare assessment on my farm? Conducting welfare assessments not only enables a farmer to determine the welfare status of individual animals and herds, but it can also help by informing management decisions through the identification of risk and problem areas and the development of solutions. It allows comparisons with other, similar farms and can give an idea as to what is possible. Welfare assessment is also a useful way of providing assurances to consumers that high welfare is being achieved. The AssureWel project (www.assurewel.org) is a UK-based collaborative project led by the RSPCA, Soil Association and University of Bristol, supported by the Tubney Charitable Trust. Its main aim is to develop a practical system of welfare outcome assessment for the major farm animal species, which can be used in farm assurance schemes. Welfare outcome assessment is a process of measuring what impact influential inputs actually have on welfare by assessing the health, physical condition and behaviour of the animals themselves. Output measures do not always need to be negative measures e.g., the presence of skin lesions. Positive indicators, such as those related to natural behaviour, can also be important considerations measuring “positive welfare” (Yeates and Main, 2007; Boissy et al, 2007; Webster, 2005). A protocol for the assessment of welfare outcomes was developed by Whay et al (2003) that has provided a basis for the development of consistent measures that minimises subjectivity and the risk of personal bias. Both qualitative and quantitative approaches are incorporated into existing systems of welfare assessment. Outcome based welfare assessments are generally quantitative in that they tend to record scores of severity or the presence/absence of physical parameters. Although there are systems of qualitative assessments that involve subjective assessments of welfare (Wemelsfelder, 2007; Rousing and Wemelsfelder, 2006 and Wemelsfelder and Lawrence, 2010) these tend to focus on subjective experience and not natural behaviour and biological functioning and are therefore best used in conjunction with quantitative outcome based parameters.